It is not just having the plants in "spinning reserve". You also have to have suppliers prepared to send you the coal or gas that you are going to burn, as well as the collection and pipeline capacity for the gas or the railroad transportation capability for the coal. And for the coal you also need the coal miners standing by to dig it out of the ground. None of this is free. In the case of nuclear, the fuel cost is trivial, and transportation is by ordinary truck - no need for anything special for new fuel (it cannot be used for any sort of weapons, except to scare the easily frightened). You do need enrichment facilities, and the skill or the people who design and manufacture it. But realize that about 10% of the electricity generated (actual generation, not capacity) in the US uses nuclear fuel that comes from one pretty small manufacturing facility. The Taiwanese keep one entire new load of fuel on site at their reactors, at all times, to be able to deal with loss of supply. That load can run the facilities for up to 2 years before it has to be replaced.
" 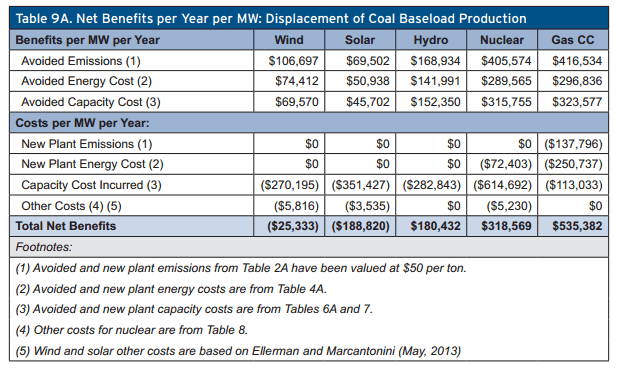 Another way to look at this -- if you put on a carbon tax in the US equal to $50 per ton of CO2 that fuel would produce, then it still likely would make no sense to be building wind or solar plants unless there remained substantial subsidies for them "
Of course the economic illiterates who can't get enough govt would say this is just fine. You could literally get a blank stare as they see no problem with major govt subsidies, ad infinitum. You can't argue with stupid. The price of carbon in Europe (with the ETS) is (significantly) below 10 euro/tonne. I think you are mixing up with your ** postscript table, i.e. you make a mistake in the text vs the table. I disagree with the analysis entirely. When I look at the 10-Ks I have yet to find any shale company that is cash flow positive or generated a true economic profit from shale gas production. The reason is likely that the energy content of the shale gas that is being produced is lower than the energy content embedded in the production process used to produce it. If I use coal to make the steel pipe that is used in drilling gas wells the energy (and CO2 emitted) needs to be part of the cost calculation. If we are talking about using natural gas from conventional sources than the analysis starts to look better but given the fact that shale muddies the water by so much by driving costs lower even though shale producers are destroyers of capital there is a problem with the analysis. Can you find anything more authoritative on the hot backup issue than a now non-existent blog post from 5 years ago? Which non-exiistent link do you mean? "I have yet to find any shale company that is cash flow positive or generated a true economic profit from shale gas production." Cash flow is meaningless for new or growing companies or industries. That is why accrual (capital) accounting was invented. If $1000 of initial costs produces $500 of yearly income for 5 years, that is a good investment. Cash flow says you lost $500 the first year. What is "true economic profit" ? So, you are guessing. The energy costs of the pipe and everything else is part of the cost of the initial investment. "Cash flow is meaningless for new or growing companies or industries." I am not talking about new companies in the sector that are just going after shale. I am talking about established players like Chesapeake and Continental. Given the steep depletion rates for shale wells a company will see most of the money generated by a well in the first two or three years. In fact, not too long ago that used to be the selling feature for investing in shale; you would not have to wait decades but will get your payback very early in the game. Funny but I don't hear that pitch any longer. "So, you are guessing. The energy costs of the pipe and everything else is part of the cost of the initial investment." Yes it is. And the first two or three years of operation will produce more than half the total gas and oil that will come from the well. But why are the accountants only depreciating a quarter to a third of the cost? It is because the energy costs are imbedded in the prices that we can be pretty certain that the return is either very low or negative. And since we need to look at the net increase that means that we will need a hell of a lot of coal to produce a net increase in shale gas or shale oil. Note that the average daily production rate in the Bakken has fallen by 10% over the last two years even though the number of wells have doubled. That may not be a problem if the wells didn't cost $7 million or more a pop and the rate were reasonable but it is a problem when you are talking about an average of 126 bpd and falling month after month. I don't know about you but I am having a hard time getting excited about investing $1.6 billion a month only to see the average decline, particularly when depleted wells are no longer counted and the weighted average age of a typical well is around three years. If we are objective and look at the numbers we do not see what we are being told that we are seeing. The actual reality on the ground is much different than the hype. Warren is a very smart guy and he should know better. Vangel has been touting this pabulum for years (not figuratively--he has been intoning this exact mantra at Carpe Diem for 4-5 years) and his dire predictions have not been supported by any evidence that the wells are uneconomic after 2-3 years. What's mysterious is why he is so emotionally invested in this meme...unless he's loaded up on shorts and needs some Al Gore-ian salvation via doom. I think that many analysts are now saying exactly the same thing that I have said all along. It is clear to anyone who looks that shale oil and gas are capital destroyers. While this does not mean that you can't make money from speculating on the greater fool being around to take what you have to sell when you need to sell it does mean that there will be a day when the shale players will have to write down shale properties just as BHP, Encana, Exxon, and a number of other producers did. The difference is that the companies that wrote down the assets had plenty of conventional properties that had real value. The shale drillers don't. Even if true so what? That's a matter for owners of these companies, not you or the government. I have never claimed it to be a matter for the government. I just want the government to stop misleading investors by not participating in the promotion of shale as happens when the USGS makes some ridiculous estimate that confused naive investors who don't know the difference between a resource and a reserve and when the SEC changes to rules to permit the booking of unproven 'reserves' that do not exist because of the poor economics. If you don't like the idea of building the true price of emitting carbon into fossil fuel use through a tax, how would you go about reducing atmospheric CO₂ to pre-industrial levels in order to maintain a planet compatible with human habitation? How about not suggesting something insane? What did I suggest and why is it insane? lol! I actually suggested a negative carbon system, but why would you think that's insane? How could it be less sane than crashing the ecology we depend on for survival with suicidal fossil fuels? Enron came up with so many great ways to make money. But this one was really on of their best. What better way to make money than selling air at a regulated prices and collecting a fat commission as well as giant profits on speculation. If you are interested I have tax credits to sell you. If temperatures go up as much as the models predict you even get a refund. I'll take all you have. Note that I will be paying in Enron stock. That seems appropriate. She's such a jerk...but fun in a perverse sort of way. That would be fine. I need to buy a frame so that I can hang it next to the Bre-X stock certificates. "If temperatures go up as much as the models predict you even get a refund." Why wouldn't you expect temperatures to go up? If you understand CO₂ going above 400PPM increased temperatures to the point where polar ice caps melted completely each and every previous time in Earth's history, why would you expect a different outcome today? What kind of investor ignores the fact that a single stock is going to destroy the value of her entire portfolio? Is that a competent investor?